This week I worked on the drawers for the huge secretary I’m building. I began with the idea that I would build these drawers using typical 18th-century construction techniques – drawer sides that are half-blind dovetailed into the fronts with through dovetails connecting the sides and backs, and drawer bottoms that slip under the backs and run in grooves cut into the sides and fronts. As I assembled the first drawer, I realized that these behemoths, being 47″ wide and 20″ deep, would be too much drawer for the 1/2″-thick drawer parts I milled. I needed a way to stiffen the drawers, and to add strength. I turned to drawer slips. Of course, slips are an English design, so I had to justify my choice. Here is how I did just that. If you look into southern furniture design, English designs were held onto longer than any of the cities in the north. As I wrote before, this secretary is going to spend at least its beginning years outside Charleston, South Carolina, so why not use drawer slips along with the other distinctively southern features already added to the piece. It’s not a period reproduction. Because I had ripped the drawer backs to 3/4″ less in width that the sides – something I do whenever I build drawers in an 18th-century manner, except very small drawers – I had to use 1″-wide pieces at the sides of the drawers to allow material above the grooves that catch the drawer bottoms. I decided to use 2 1/2″-wide stock at the center of each drawer, again for support and for strength. The photo immediately above shows the pieces as seen from the front. Small tongues fit into a groove cut into the drawer fronts. As you can see, there is a lot of work in these pieces. The photo to the left shows the back end of a set of slips. Each drawer requires a set. The outer slips notch under the drawer back while the center piece, being 3/4″ thick, also is notched at the top to fit just under the drawer back. The opening photo shows a side piece installed in a drawer box. 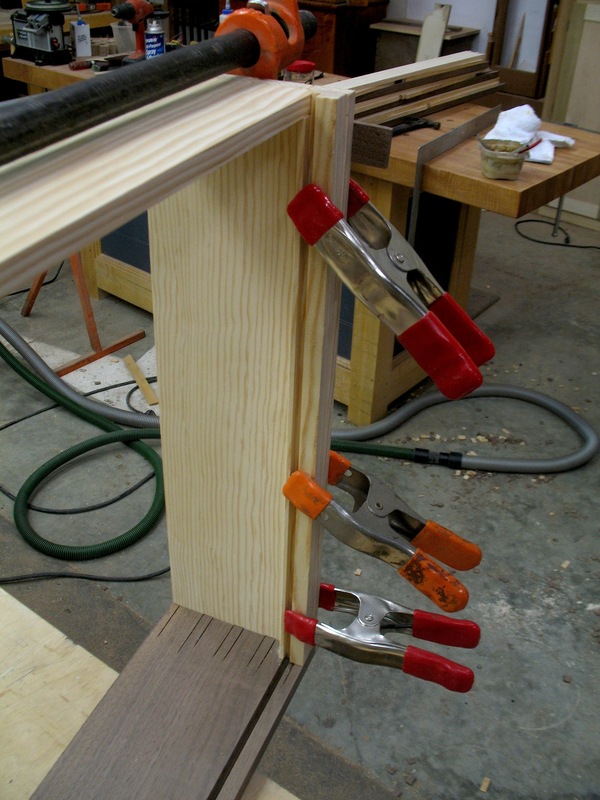 A small bead of glue is spread on the slip and tongue then spring clamps hold the piece in position as the glue dries. The last photo, at the right, shows how the center piece is installed. 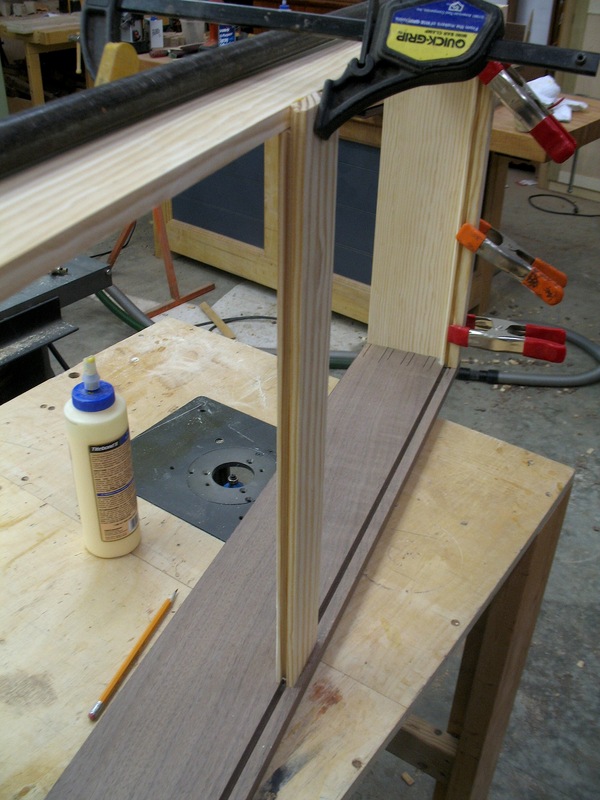 The tongue is glued in the front groove while glue and two nails hold the piece at the back. 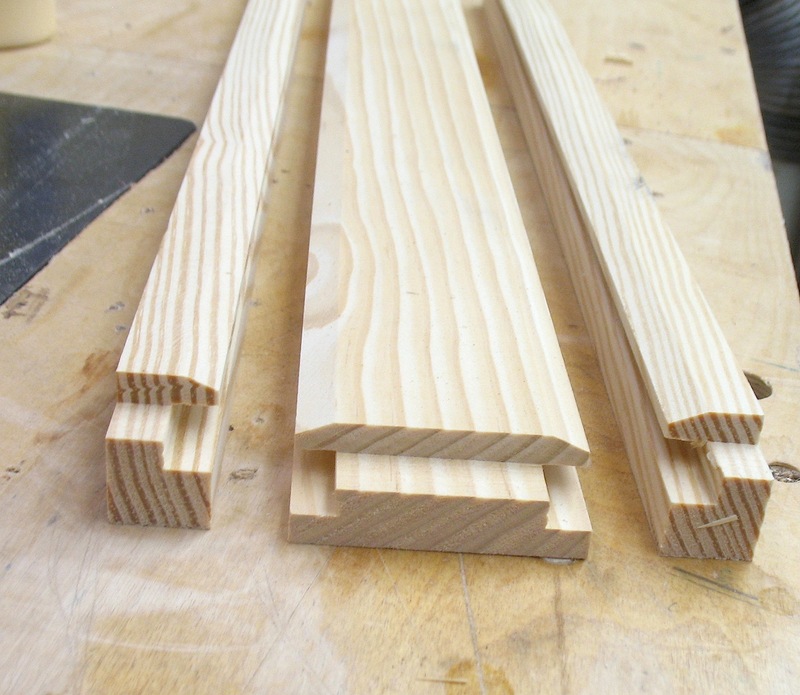 One thing to make sure of, if you use this technique, is that your drawer boxes are square. Once installed, drawer slips tend to hold the drawer as it is – you’re not going to use your drawer bottoms to help square a drawer. I am very happy with the results of the added slips. My drawers tightened up nicely and the added strength is welcomed. Can you imagine how these drawers would have reacted if a single drawer bottom were hung in the 1/4″ deep grooves? Even if nailed solid along the back edge, there would have been trouble. And once the bottoms are in place, the look of the inside of the drawers is clean. Glen, how thick is the back? Are you concerned ablut it drooping over time? Backs are 1/2″ thick just as the sides. The narrow top drawer back is 2 3/4″ top to bottom and the overall width of the drawer is smaller due to the lopers that hold the lid when open. That means less weight in the drawer bottoms, so I don’t expect any trouble in the near term. However, if this piece stands the test of time, and I think it will without question, I would expect to see some drooping in a century or two – I can live with that. Lower drawer backs are wider with each stepping in tune with the 3/4″ thickness of the drawer blades. as a result, I don’t expect any significant trouble with those drawers. 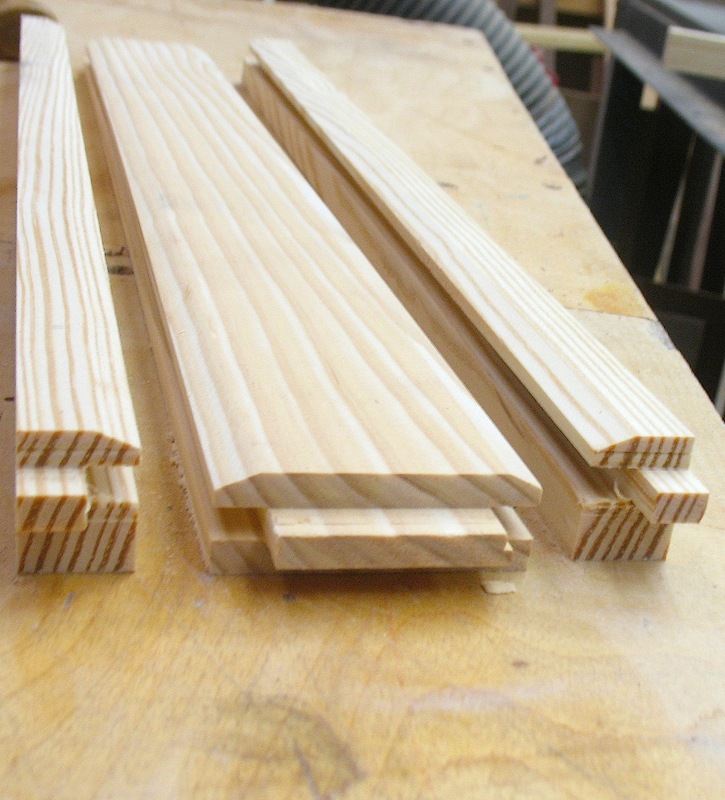 Also, I’ll hold my drawer bottom thickness to 1/2″ to 5/8″ in thickness. Will you make the “giant Secretary” project into a published from such as you have in your construction format books? I’m wrapping up the final projects in my shop addition, so haven’t as yet started on the 18th Cent. New England Desk and Bookcase Secretary. My friend, Terry Widner, here in Tallahassee, and I were discussing his work on that plan and he challenged me to consider your latest unit. It has been interesting following you blog on this unit. I don’t think this secretary is a publishable piece. The size makes it too big to fit in most houses built in the last 60 years. I would be happy, once the piece is complete, to send plans out if you’re interested. Thanks Glen for your very prompt reply. I just, once again measured a spot in my living room where it might fit, but it also might be to overpowering in stature. I’ll keep thinking about it for a while, and please do keep me in mind for a copy of the plans. I ALWAYS gain a great deal of knowledge from reading plan sheets, and find myself from time to time rereading from A. W. Marlow and Thos. Moser books I have in my library.